We spend approximately one third of our lives sleeping. Sleep allows our body to restore itself for the day both energy wise and physically. Common sleeping positions often lead to poor sleeping posture, neck and back pain when sleeping, pressure on the different joints of the body, and injuries due to sleeping. 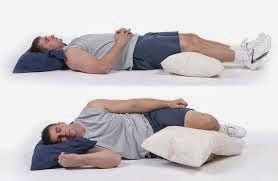 With respect to our sleeping position we should either sleep on our sides (with a pillow between knees) or back (a pillow under knees) and never on our stomach. Sleeping on the stomach reverses your spinal curves and places a lot of force on the joints of the body. Are you sleeping properly? If you are not you can injure yourself and interfere with your body’s recuperation time. We should never sleep with our arms up above chest height, with our hands under our pillow, or with our legs rotated forward and bent too high. Your body should be in a straight alignment. Your pillow should be replaced every 1 – 2 years unless you sleep with a water pillow and these last normally 5 years. The pillow should be at a height so that when you lie on your side your neck and head are straight and not bent down or up. If you are wondering about your pillow please bring it in and Dr. Barbara Rodwin can check the height and age of it for you. We have pillows to loan out, ask the front desk about borrowing one if you would like to. You should try to go to sleep at the same time each night. The room you sleep in should be as dark as you can make it. Do not sleep with your cell phone under your pillow as studies have indicated that the cell phone emits harmful radiation that can damage your brain and lead to brain cancer or tumors. If you have problems falling asleep or you wake up in the middle of the night you can take natural supplements to aid in getting a good night’s sleep. These can include: melatonin, 5-HTP, taurine, magnesium, Phosphatidlyserine, and several other ones. If you have problems sleeping email Dr. Rodwin and she can make suggestions to ensure you obtain a good night’s sleep! Mattresses last for 10 to 12 years. If yours is older than this, it is time to replace it. A mattress is important to getting a good night’s sleep and allows our body to feel good! There are so many types in this day and age to choose from. You should ensure you do your research before going out to look for one and understand the warranty and exchange policy the company offers for the one you purchase. There are basically three comfort preferences: soft (Pillow Top), plush and firm. There are also varying forms of the Pillow Top. Learn about the support system- foam or innerspring. 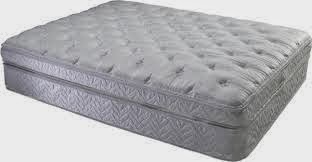 A good support system provides good support whether your mattress is a pillow top, plush or firm. Never put a new mattress on an old foundation. You can also look at purchasing a latex or memory foam mattress. Mattress buying is the most important decision you will make in furnishing your home, since you and your loved ones will spend close to one-third of your lives sleeping on your mattresses. For a mattress that costs $1,000, you spend approximately three cents a day. Aim to buy the best mattress you can for the money. For more information on mattresses please ask Dr. Barbara Rodwin. Are you tired of feeling tired? If you are find out how to increase your energy! Ask Dr. Barbara Rodwin.